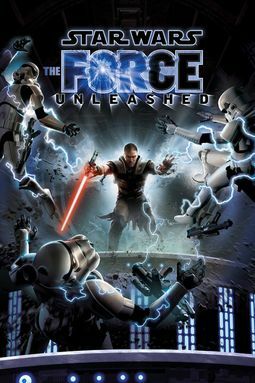 The Force Unleashed was a long time coming when it finally hit store shelves. Many people got hyped about the physics engine that LucasArts had been pushing with detailed destructible environments, but my guess is that it was simply the Star Wars name that resulted in so much hype. Whatever the reason for the hype, The Force Unleashed came with very high demands. What we ended up getting is a very fun but rather shallow experience that didn\'t meet all of those demands, but still offers enough redeeming qualities to warrant . Now that I\'ve gotten rid of the suspense surrounding my final take on the game, let\'s actually take a look at where the Force is strong with this one. First things first, though. In case if you missed it in the header, this is a review of the Wii version of the game. There are many ways in which it is similar to other versions of the game, but be careful of using this review as a primary source of information if you are interested in one of the other releases. Trying this again, shall we get down to business? When the game opens up with sounds and music straight out of Star Wars, you will begin to anticipate a genuine Star Wars experience. When the opening sequence of the game begins with Darth Vader arriving on the Wookie planet of Kashyyyk, you know beyond doubt that this is truly Star Wars. 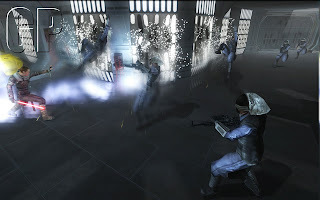 If there\'s one thing that The Force Unleashed does well, it\'s capturing the atmosphere and spirit of the films. As the plot unfolds, we play the part of Vader\'s secret apprentice, Galen Marek. The story takes place in the time between the Episode III and Episode IV films. Since I hate spoilers just as much as the next person, I won\'t be detailing much of the plot whatsoever. However, the story does a good job of filling in some of the gaps between those films. For the most part, the characters and character interaction are fairly solid and interesting. In all reality, the biggest letdown in regards to the story is that there are a couple of elements that are iffy when it comes to Star Wars canon. In fact, one of the endings completely throws canon out the window. Then again, only well-informed Star Wars fans are likely to pick up on these things., and the bulk of the story is still a worthy addition to Star Wars canon. On the other hand, The Force Unleashed is first and foremost an action game, and these few issues with the story progression carry little weight with them in regards to actually playing the game. Fortunately, first and foremost, the game is a ton of fun to play. Yes, you pretty much do the same things over and over, but the things you do carry enough thrill- and cool-factor with them that the repetitive nature of the combat can be overlooked for at least long enough to play through the story mode. Again, I should point out that I\'m talking about the Wii version of the game here, as that greatly affects the gameplay. See, the game really is about unleashing the Force. You can do this in all kinds of ways. From the simple yet effective Force Push to the wide-area Force Lightning and a host of other attacks, the game\'s tools of destruction are pretty diverse. More importantly, Wii control actually makes them even more fun to use. A quick thrust of the Nunchuck results in Force Push. Angled slashing with Wiimote results in similarly angled saber strikes. Far and away, one of the most enjoyable techniques in the game is a combination of Force Grip and Lightsaber Throw; it\'s also one of the most brutal techniques available. Using a common enough grip move, you can hold a foe in place. 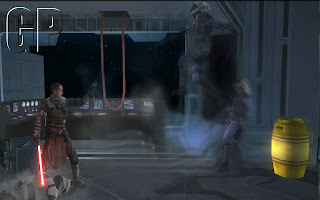 Once your foe is suspended in the air, forcefully swinging your Wiimote results in throwing the lightsaber, sticking it in the suspended foe. However, this is just one example of the ways you can use and combine Force powers and lightsaber skills for maximum damage. Though the clear emphasis in the game is on the actual combat, there are some minor RPG elements added for good measure. Fallen enemies gives you points that can be used at any time in the game menu to improve the potency of Force techniques and gain new ones altogether. Getting more powerful Force tools isn\'t altogether necessary to progress in the game, but having them builds on the cool-factor. As a result, the skill leveling system is mostly in effect to get you to destroy everything in sight. On another note, the straightforward hack, slash, and Force Push gameplay is broken up with boss fights from time to time. Boss fights do make heavy use of the core engine, but there is a clear shift from emphasis on overwhelming force in favor of a more tactical approach. There are also occasional duel moments in which you\'ll lock blades with a foe. In these cases, you must align your Nunchuck or Wiimote with the angle shown on the screen and physically push forward. Additionally, timed-sequence moments take place during boss fights. Though these timed-sequences are a simple matter of moving the Nunchuck or Wiimote (whichever is shown on screen), it\'s actually quite possible to move the wrong one if you start to hurry. Still, there is the matter of the repetitive gameplay. Playing through the story is a fairly short experience of 6-7 hours. For that duration, the simple formula of running from the beginning to the end of a mission killing anything that stands in your way stays entertaining. Whether or not it holds up long after that is very dependent on how much you enjoy the game\'s action. There are a few things hidden throughout the levels (concept art for the gallery, lightsaber color crystals) to encourage replaying the game. However, annoyingly, there is no mission select option; if you want to go back and play the third level, you will have to start your game over from the beginning. Exclusive to the Wii version is a duel mode. 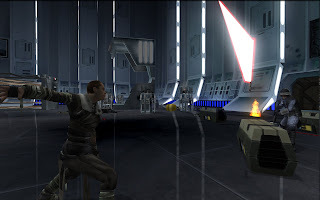 The duel mode allows you and a local friend to choose from a host of Star Wars characters (some from the game, some from the films), select a map, and duke it out. The camera is fixed in a stationary location during duels (with the exception of the quick-time event moments that show up from time to time). Essentially, the duel mode is a modified form of the boss fights. The same Force powers and techniques from the main game are carried over to duel mode, so very little should be unfamiliar. The thing is, while duel mode is a nice idea, the implementation simply isn\'t a lot of fun. The repetitive combat isn\'t terribly off-putting in the context of the main game, but it\'s a lot harder to overlook in duel mode. As a result, duel mode ends up being an occasional diversion at best. Unfortunately, the game\'s shortcomings do not stop there. Not the least of these shortcomings is the graphical department. I wish I were just referring to a small issue here or there, but the reality is that the decent elements of the graphics are the exception to the rule. The character models in The Force Unleashed are undetailed and jagged. Add to this that the texture maps are equally lacking, and the result is, in a word, ugly. In the story-driven cutscenes, the lacking nature of the graphics is very obvious. On the other hand, the pacing of the game\'s action actually does a good job of hiding these things. In all fairness, when playing at full pace, you may not even notice the lack of detail in the graphics. However, you will probably notice some of the special effects that are included in the game. Blur effects employed when using Force Push are actually impressive. Still, they do not compensate for an overall weak graphical effort. Though not exactly a disappointment, the game\'s sound direction fails to impress. Yes, lightsabers sound like lightsabers. Yes, Stormtroopers sound like Stormtroopers. Yes, the all-memorable themes are here. Everything works, but there is still something left to be desired in the voice acting. It\'s not that the voice acting is terrible, it\'s that it sometimes comes off as flat and uninspired. This generalization of being neither terrible nor altogether excellent carries over to most parts of the game, and the moral aspect is no exception to this. As you\'ve no doubt figured out, The Force Unleashed gives heavy emphasis to violence. 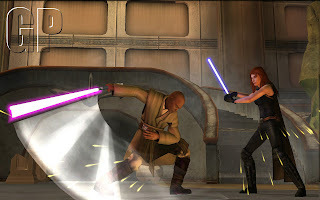 Throughout the course of the game, you can, and will, strike down countless hoards of enemies with the lightsaber. Use of the Force allows you to dispatch foes by remotely choking them to death, send them soaring off a cliff, crushing them with nearby objects, electrifying them with lightning, and reflecting their blaster fire. However, in spite of the strong emphasis on violence, the quantity-over-quality approach manages to leave you feeling a bit distanced from the violence. The issue of annihilating masses of foes (human and alien alike) to keep Vader\'s order of leaving no witnesses plays little bearing on the gameplay (since you don\'t actually have to kill everything), but it is there in concept. Beyond the violence is the possible point of concern that is the Force. As with the films, the Force is presented as a morally neutral supernatural force that can be used to assist a wielder in a variety of ways such as telekinetically moving objects as well as sensing things in the future. Though I do not recall any profanities, it is not unheard of for the Star Wars games to include a few uses of "dang" or "hell." Sexuality is generally minor. Clothing (or lack thereof) on some of the female characters is the biggest issue in this department. Your ship\'s pilot, Juno, along with some of the female bounty hunters you will fight, wear cleavage-revealing attire. Lastly, two female boss characters wear little more than a bikini. When all is said and done, The Force Unleashed really isn\'t worthy of any awards for greatness. If I were to make use of a list of the strengths and weaknesses for the game, it probably wouldn\'t fare that well on paper. With that in mind, I won\'t be calling it something it isn\'t. However, such a checklist would misrepresent the game. The reality is that it is a great deal of fun for at least a complete play-through. It is repetitive, but it manages to carry enough appeal and fun with it that the repetitive nature is easy enough to forget about for a while. Also to the game\'s credit, even though the Star Wars geek in me wants to cry foul at the slightest hint of breaking canon, it really does do the license justice. The game won\'t last forever, but if you won\'t be put off by its constant violence or some of its mediocre technical qualities, I wouldn\'t hesitate to recommend that you rent it or even purchase it if you can find a good discount.